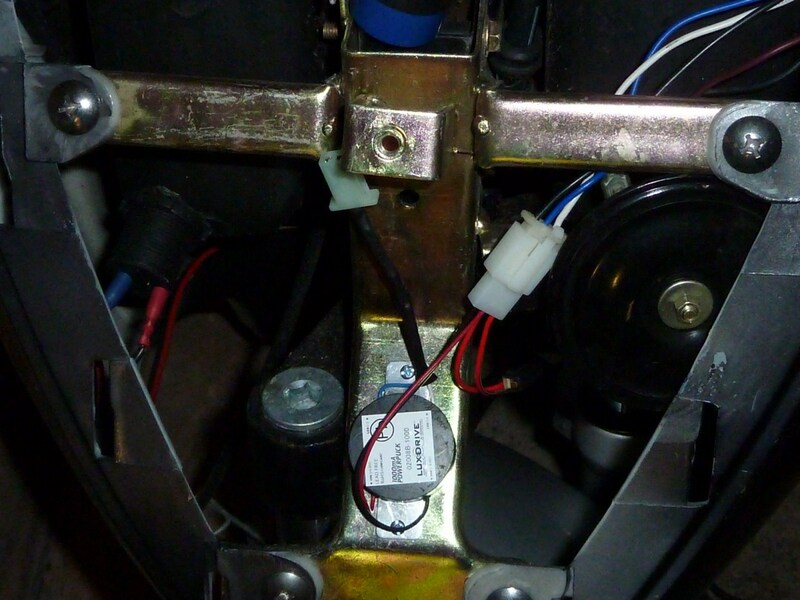 This upgrade is based on deecee’s upgrade on the Electric Motoring Forum, though I’ve done a couple of things differently so that the main beam switch functions and it should therefore be MOT-inspection compliant. 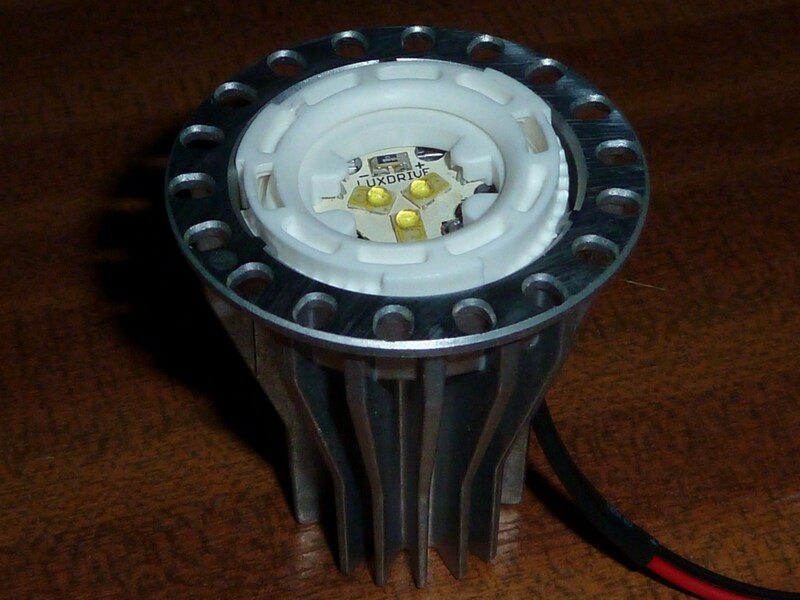 The design is based around a little, three-LED board that sits on top of a whopping heat sink. 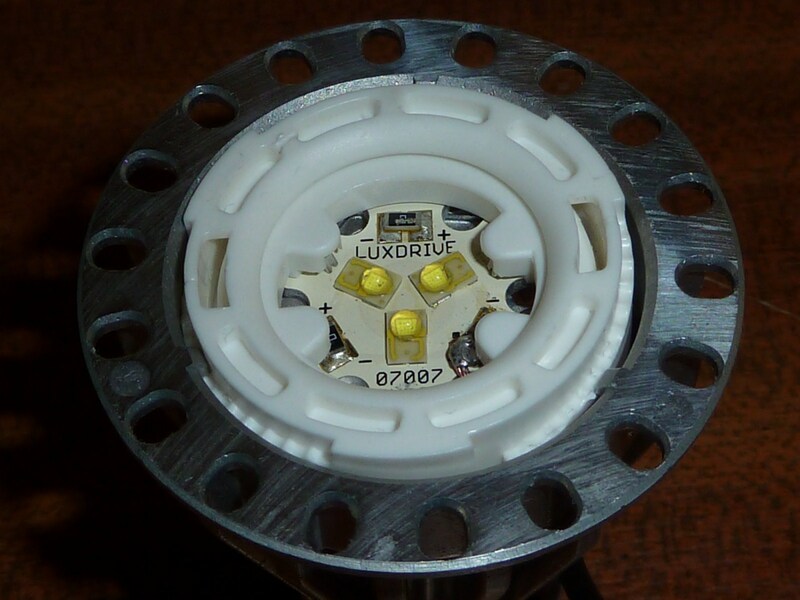 The LED board delivers an impressive 540 lumens, and is more than a match for the standard 35W dual-filament bulb that it replaces, putting out around 45W equivalent but consuming a mere 11W on full power. 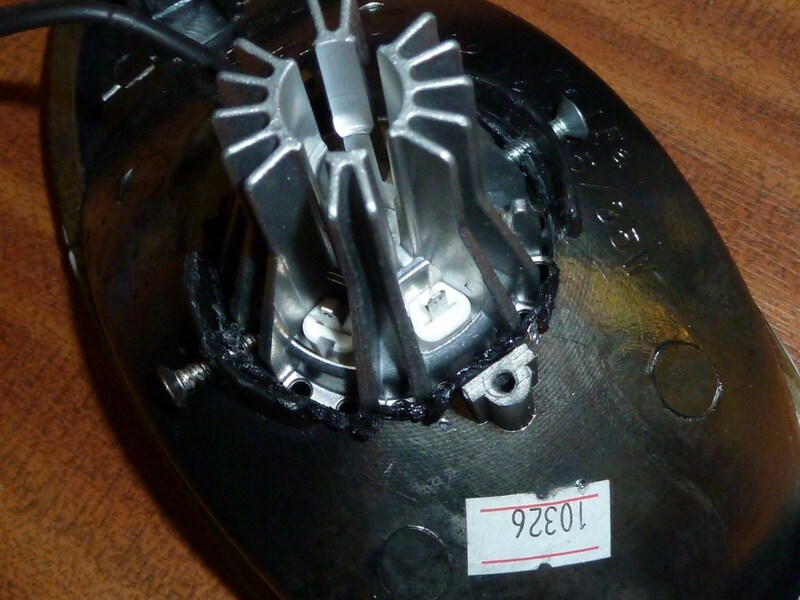 Here you can see the ‘star board’ module sitting in its heatsink. The key to getting this all working is to completely ignore the contacts on the plastic contact carrier that holds it in place. The one I had would not make contact in a way that would allow all three LEDs to operate at once, so I just soldered wires directly +/- terminals that you can see on the board bottom right. I just used the plastic contact assembly that came with it to hold the whole thing together, and snipped off the points where they wrongly made contact with terminals on the board. That done, and with the locking ring in place, you have a little unit served by a couple of power wires. In my case I had a red/black pair that I wired up to a 2-way mini-connector. 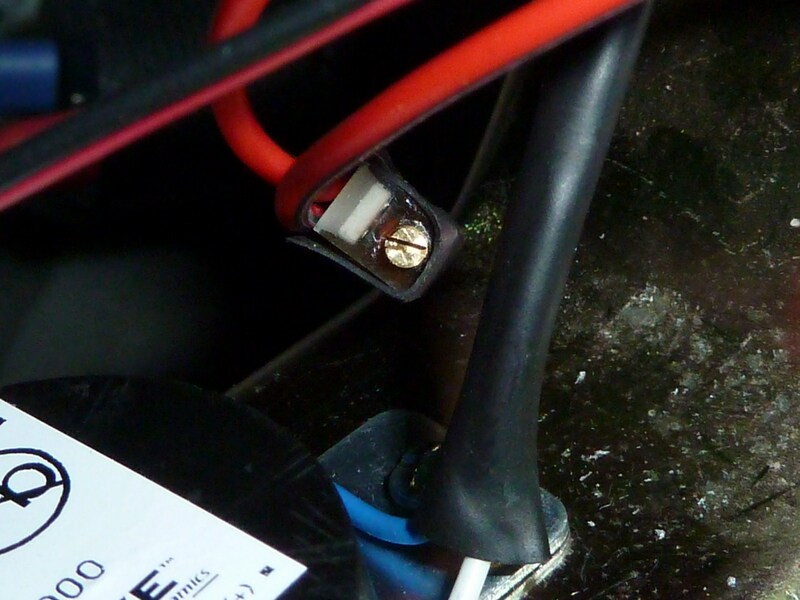 However it isn’t as simple as just plugging this into your 12 volt power supply from the loom. You also need a small 1000mA regulator in the form of the powerpuck driver, to make sure the starboard gets a nice, clean power source. 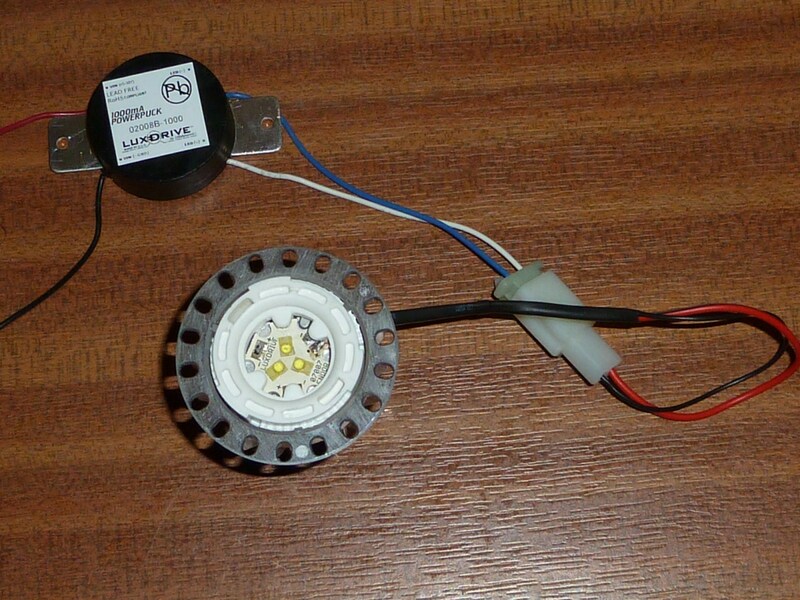 The powerpuck is fed by regular, 12V power via red/black wires, and has two output wires, white (+) and blue (-) which serve the LED board. I connected a counterpart two-way connector to these so that they connected to the power wires serving the board. The final assembly looks like below. 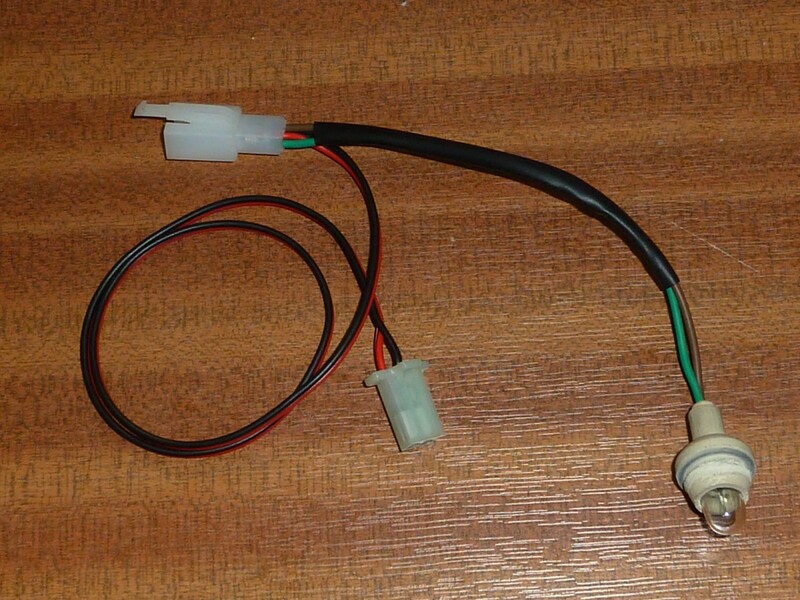 however I suggest you make your power wires for the startboard at least 14″ (350mm) or you will struggle to make the headlamp assembly reach when you fit it all onto the bike. 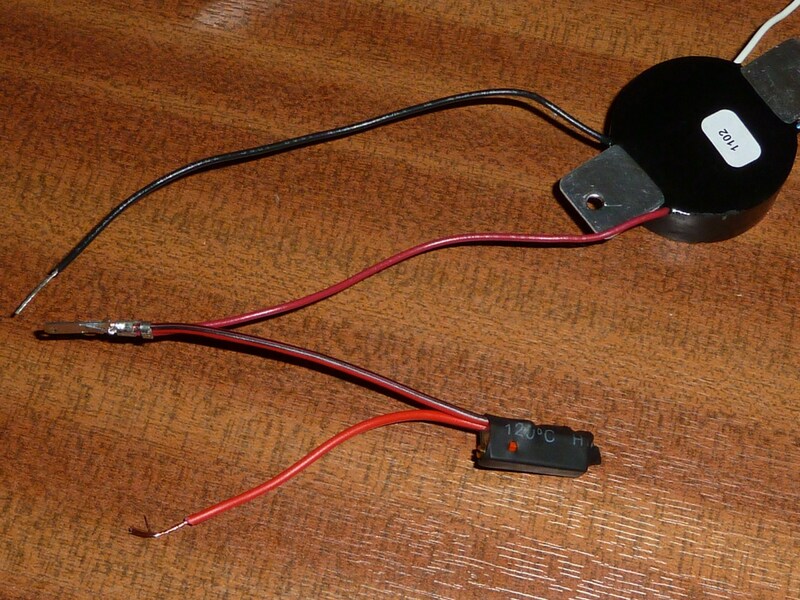 I tested the whole assembly beforehand on my desk with a spare 12V battery. 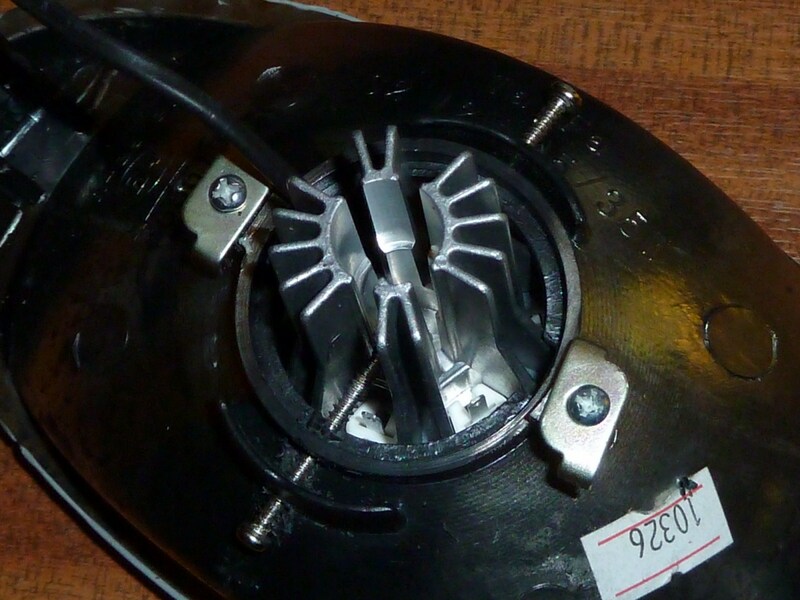 Pay very careful attention when connecting up the powerpuck driver to the 12V source. Even momentarily misconnecting this will destroy it! You can just push it through as far as it will go and use it like that. This however, means the LEDs stand quite a way proud of the reflector in the housing, casting its own shadow behind it and giving the headlight an odd ‘pinhole’ effect which I wasn’t happy with. To make proper use of the reflector, the module should really go all the way back so that the LED board sits close to its focal point. To achieve this I did the messy job of using a soldering iron to melt the hole out to a bigger size. The final hole was just tight enough for the module to wedge into nice and firmly. I then held it in place with a pair of shorter screws. Not pretty from behind, but does the job nicely! You should also bear in mind that the beam from the LED board is more directional, so the unit should be inclined downwards slightly with respect to the headlight casing so that it actually points down onto the road and not off into the horizon. Something that was a bit of a conundrum was how to make a single pole module compatible with the switching system designed for a dual-pole bulb. 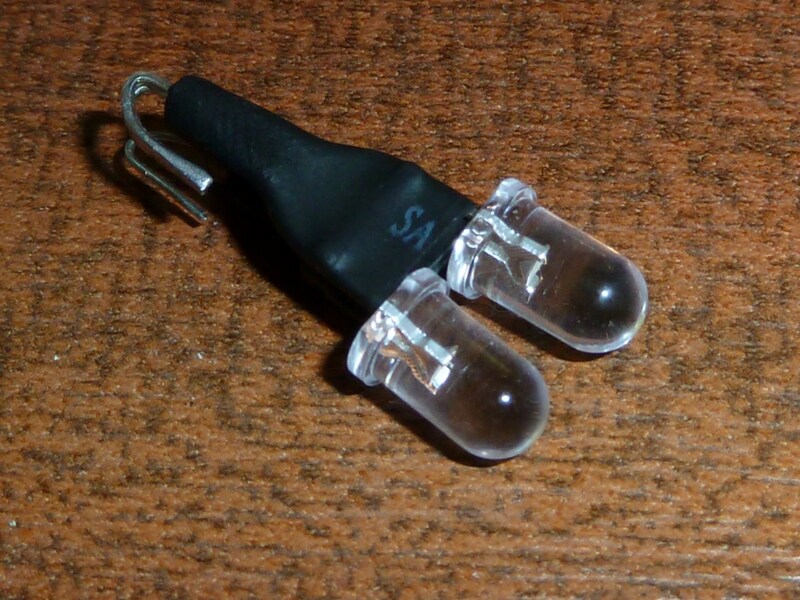 The oginal bulb has two inputs in additon to the black ground wire. One input gives the ordinary headlight ‘on’ position, while the other powers up an extra filament to give an extra bright ‘main’ beam. In the case of the Ego scooter, a white wire powers the ordinary filament, while the blue powers the ‘main beam’. So what do we do when we have these two power wires serving a single power input? Both wires ultimately have to serve the regulator for a single LED circuit, yet we need two separate ‘modes’ for doing this. Here you can see my three-pin assembly come together, where my extra pin is connected to the main beam power wire via a small variable resistor. 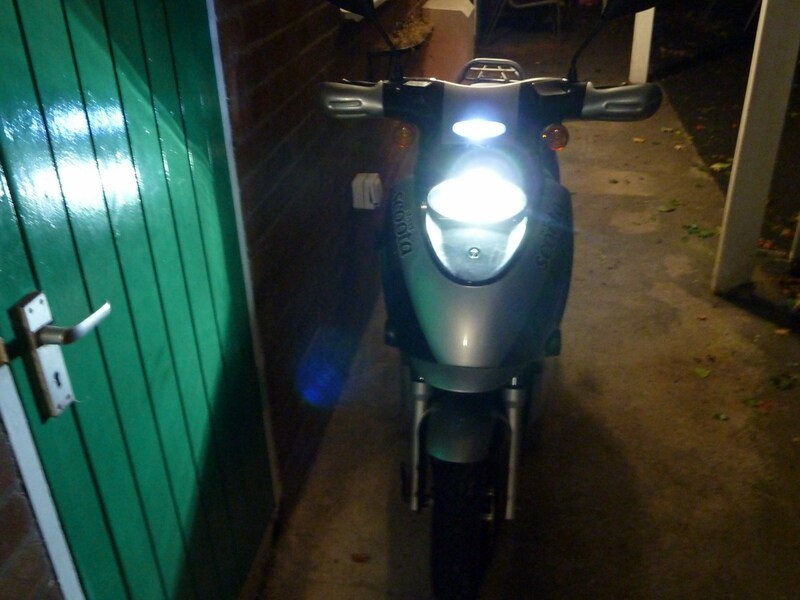 The Ego scooter has a ‘sidelight’ consisting of a smaller light fitting directly above the main headlight housing (see further down). 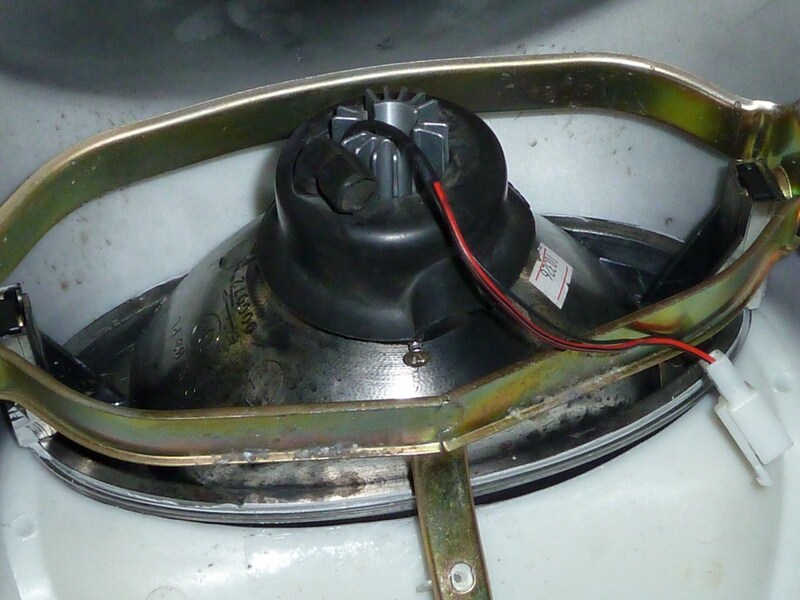 This sidelight is powered by a little 5W bulb. In deecee’s version of the upgrade, he had a small strip of LEDs within the main headlight fitting that would come on with the sidelight, to make it more like the way car headlights function (with a less-powerful bulb coming on in ‘sidelight mode’). I haven’t done this, but to keep this option open, and to allow for the addition of extra LED ‘bling’, I’ve wired a little two-way mini connector into the circuit powering the ‘sidelight’ so that I can add things later. My main interest in this fitting at this juncture, though, is in replacing that nasty tungsten bulb with something a bit nicer. In the LED indicator warning lights upgrade, I cobbled together a makeshift replacement out of a single, superbright LED. For my sidelight bulb, though, I wanted something a little brighter. 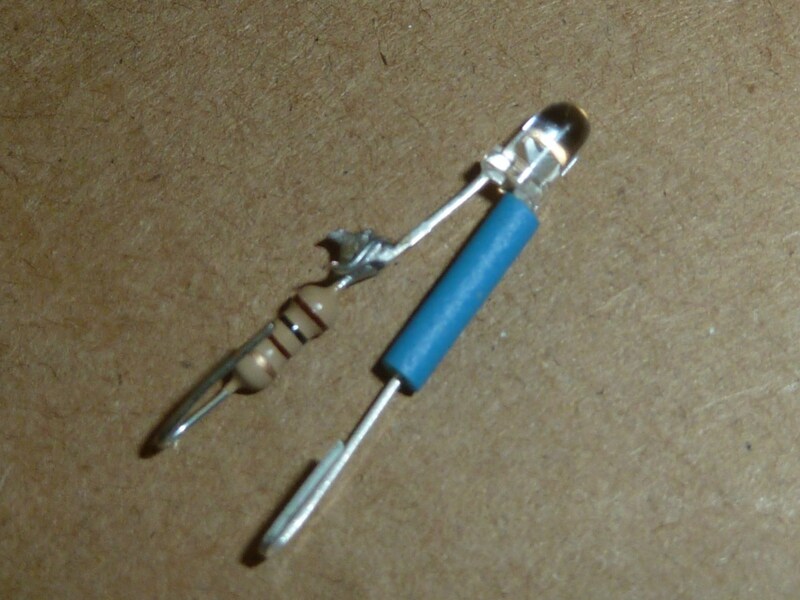 Using the same 100Ω resistor to drop the voltage down to around 3V, I simply soldered a couple of of superbright LEDs together in parallel, then put a piece of heatshrink around the resulting assembly, et voila! Meanwhile, under the ‘hood’, I had to find somewhere to mount the regulator for the new headlight assembly. The crossbar seemed like a perfect place for this, as it would be tucked away and well sheltered from any wet thrown up from the road.I drilled a couple of small holes and bolted the assembly on at the mount points with a pair of 3M screws. 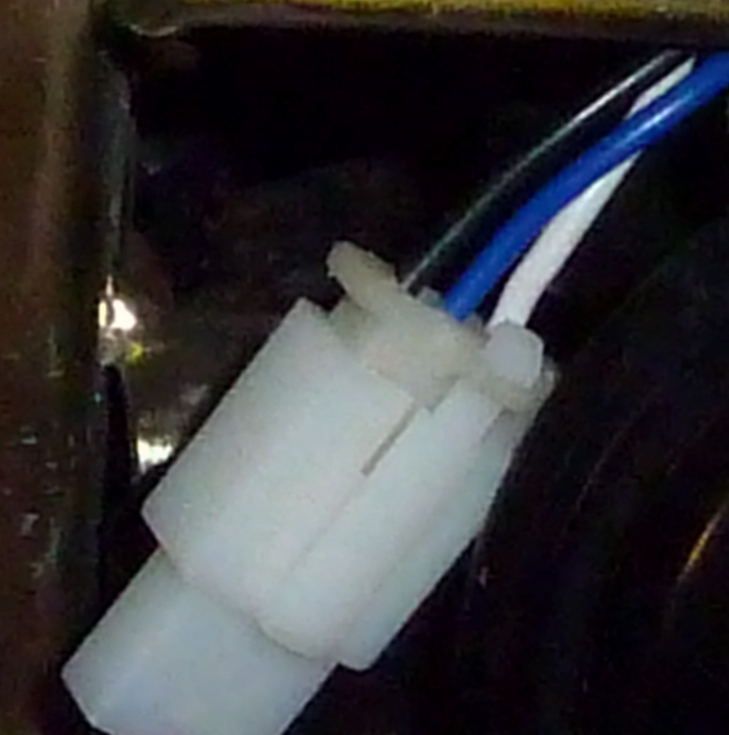 Finally I plugged the new assembly into the power connector that used to serve the old headlight fitting. 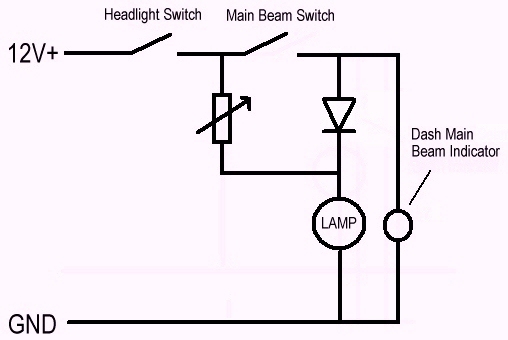 Note the variable resistor which sets the lighting level of the regular headlight beam as a proportion of full intensity. 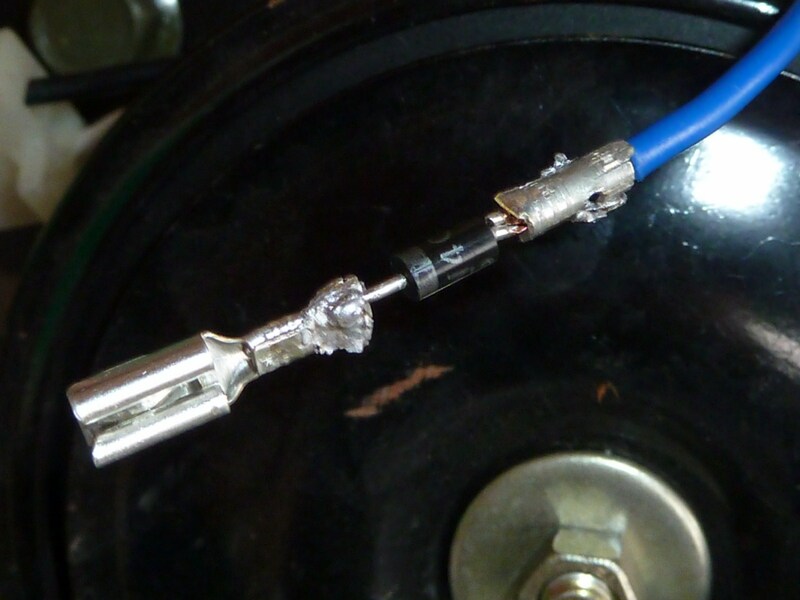 The resistor can be adjusted from the underside of the bike with a small screwdriver. 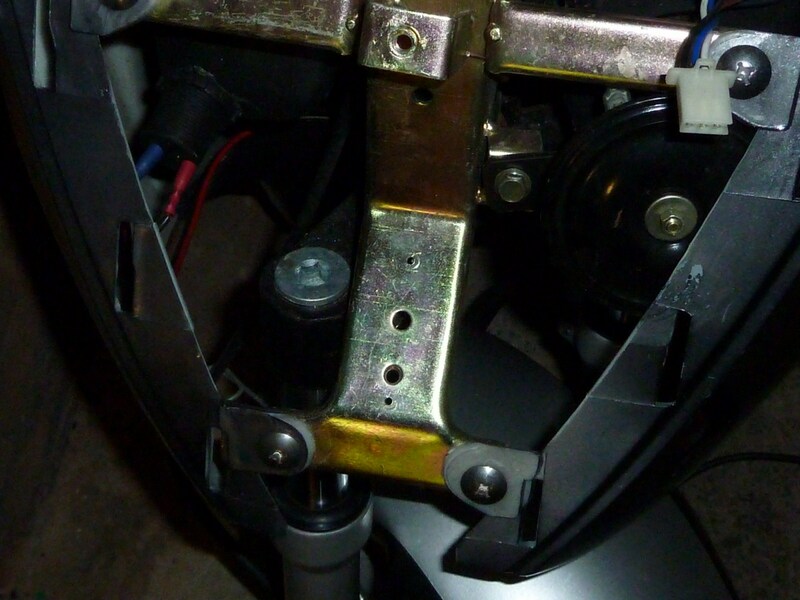 The headlight fitting has now been re-mounted onto the underside of the bike’s front-panel. I’ve fitted a used, rubber seal I got hold of from my local scooter shop. 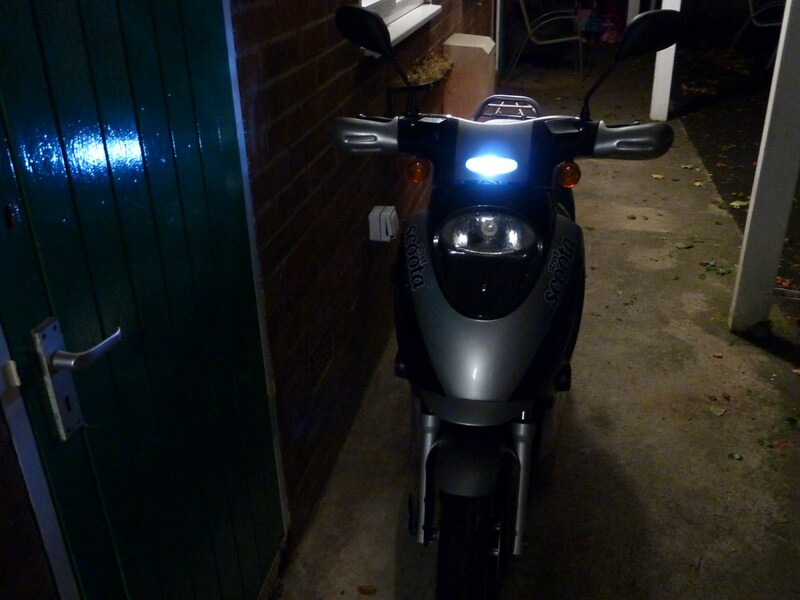 The front-panel is now ready to go back onto the bike, and the LED power connector can be hooked up to the regulator. The result is great, I think. 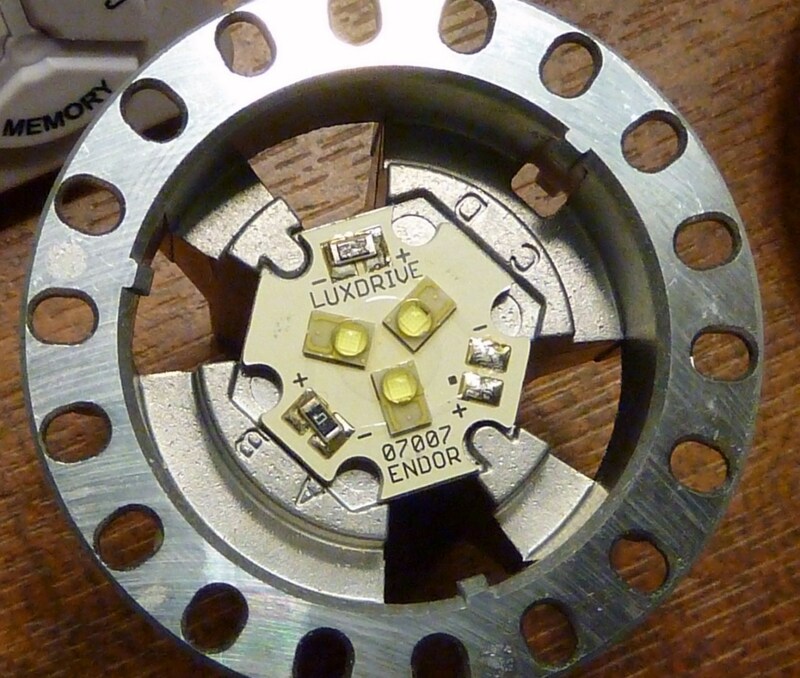 In the place of the old light bulb is the high-tech face of the star-module sitting in its heatsink. The whole assembly sits nice and far back so it doesn’t cast its own shadow over the reflector. 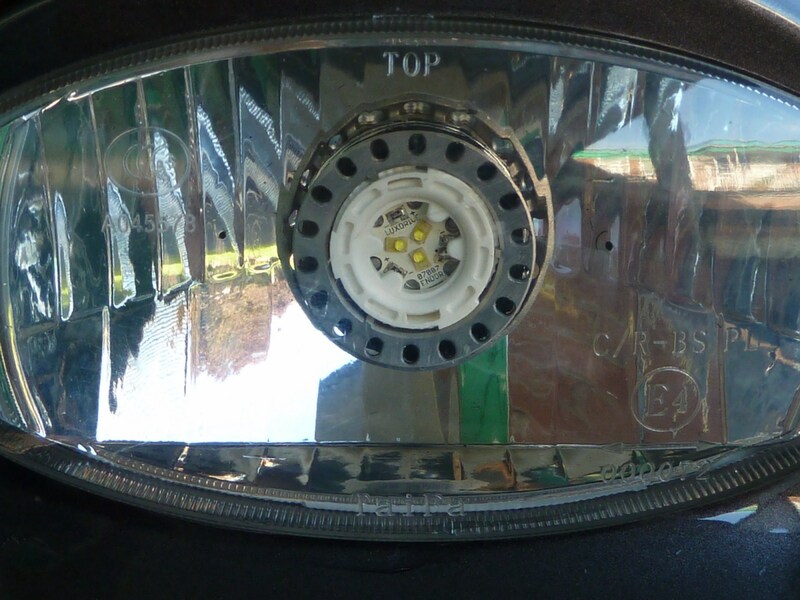 To get an idea of how the quality of light differs from the old tungsten bulbs, here is the LED headlight pictured alongside the tungsten bulb ‘sidelight’. 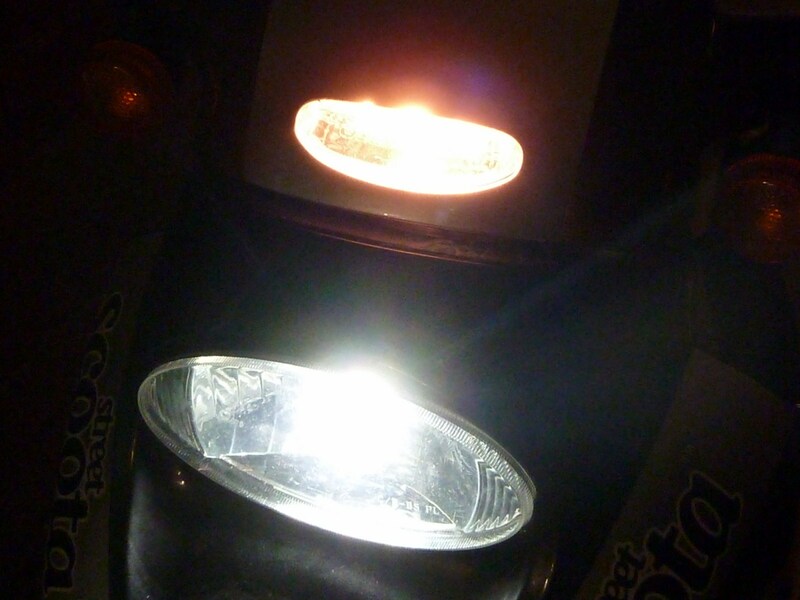 Look how clean and white the LED illumination is compared to the muddy, reddish glow of its counterpart. You can see it all in action on this short YouTube video! There is one minor shortcoming to my approach though, which concerns the behaviour of the main-beam indicator light on the dash. Because I’m shorting the regular headlight power input with the input from the main beam switch (via the variable resistor) the result is that the main beam indicator on the display is lit both in regular and main beam mode – it’s slightly dimmer in regular mode, then gets brighter when you switch to main beam. The solution to this is to install a diode to stop ‘back-flow’ up the main beam wire and into the circuit serving the main beam indicator light. 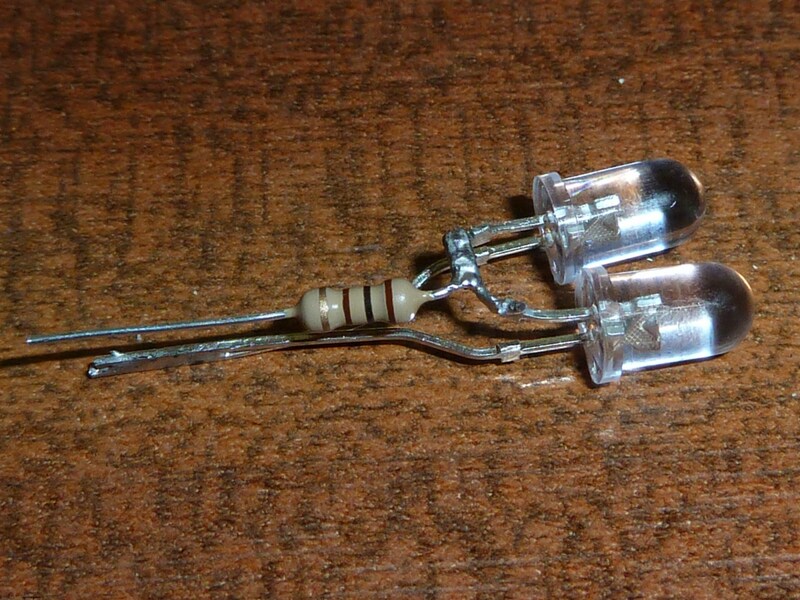 After taking advice on this, I settled on a 1N4007 1A diode, which I’ve crimped and soldered into the main beam wire. This entry was posted on Tuesday, May 24th, 2011 at 3:06 pm and is filed under 1. Main Blog, 4.4. LED Headlight Upgrade. You can follow any responses to this entry through the RSS 2.0 feed. You can leave a response, or trackback from your own site. I’m not sure this will be MOT compliant as normal headlights don’t just vary the brightness of the light but also the beam angles, which I’m pretty sure they check as part of the MOT. That may just be to make sure the beam is not too high in which case you could be ok. Yes, I thought about this, and have angled the unit so it is directed towards the road a suitable distance ahead. I’m pretty sure they only check the beams (via special markings on a wall) for cars, as I don’t think it would be practical for mopeds, what with it being angled on a stand in its parked position. 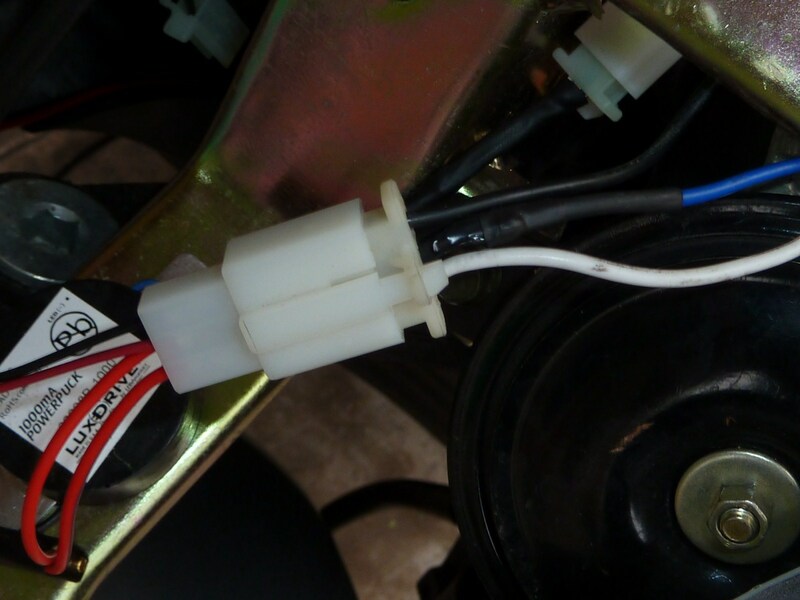 I don’t recall them ever doing anything like this for any of my motorbikes, I’m guessing that they just switch main beam on and off to make sure it all works in a plausible way. 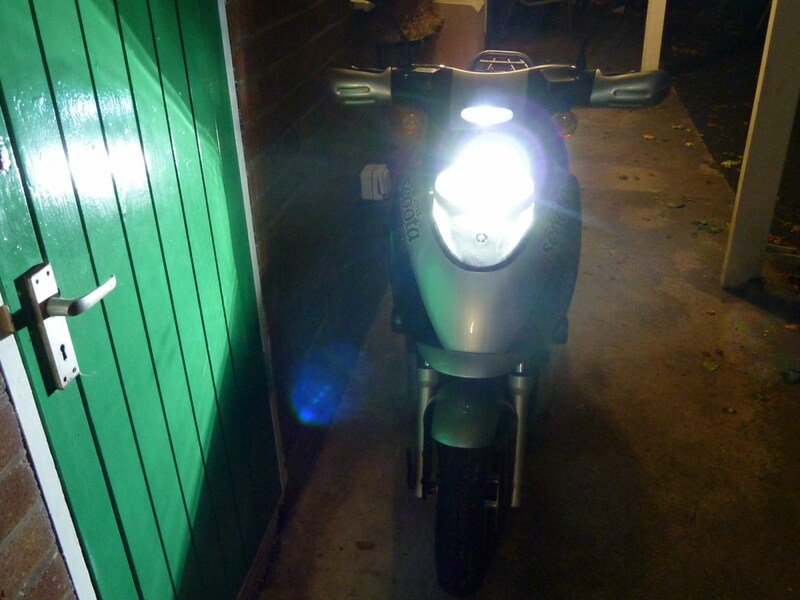 I think it’s also generally understood that the main purpose of lights on a moped or small bike is to get you seen, rather than to illuminate the road to a high technical standard. Worst case scenario is I just bodge the old fitting back in temporarily for the MOT. I think I might just pop into one of these MOT places and ask about it.